Put on your 'shorts and shades' and join us for a relaxing escape from your every day routine. 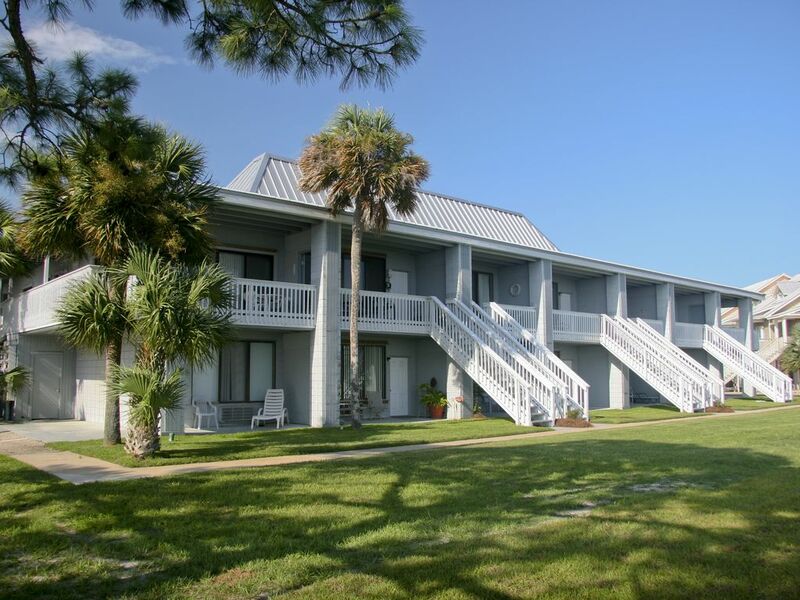 Our comfortable 1 bedroom/1 bath condo is located on the 2nd floor (Unit F13) of George's Lighthouse Pointe on Ochlockonee Bay, 40 miles south of Tallahassee on Hwy. 98. Right outside our front door is a balcony where you can enjoy a gorgeous view of the bay. To the back of us, there is a wonderful view of the marina. Just a few steps away is Angelo's Restaurant, regularly voted as one of the 'Top 100 Restaurants in Florida'. Angelo's boasts mouth watering seafood (and other dishes), with indoor seating and casual outdoor seating right over the water! We offer 874 sq. ft. of living area, which includes 1 bedroom, 1 bathroom, den, kitchen and balcony overlooking the bay. The family area is furnished with comfortable den furniture, 34 in. TV, DVD, and offers a great view of the bay. This area is is separated from the kitchen by a bar. Our bedroom is furnished with a king-size bed and a twin bed and a small hideaway cot (suitable for a child under age 10). These accommodations will sleep 3 to 4 people comfortably. Perfect for a couple or small family. The fishing is as good as it gets in this area. You can fish in the bay, head out for deep-sea fishing, or go down the river for fresh water fishing. We have it all!!! You can book a fishing charter with your choice of licensed captains, who are ready to take you out for an experience that you won't soon forget! Although many fishermen prefer to bring their own boat, boat trailers are not allowed in the common areas of George's Lighthouse Pointe and the condo only has one parking space. Another local attraction are the beaches. The closest beach is Mashes Sands in Panacea (less than 1 mi.). It offers a beautiful, small beach. The beach is located on the bay and is pretty shallow for a good ways out, offering safety for small children and a great opportunity for shelling. Next are the gorgeous beaches at Alligator Point and Bald Point State Park (about 7 mi. ), where you can enjoy sunbathing, snorkeling, swimming, fishing, canoeing, kayaking, hiking, bird watching and nature study. Within a few minutes drive are two of the nation's TOP TEN RATED BEACHES, St. George Island State Park, near Apalachicola, and St. Joseph Peninsula State Park, near Port St. Joe. Both parks contain miles of undeveloped beaches, emerald waters and white sugar sand. Other nearby attractions include St. Vincent National Wildlife Refuge, an unspoiled barrier island just offshore from the mouth of the Apalachicola River in the Gulf of Mexico. The island is a haven for endangered and threatened species, including bald eagles, wood storks, sea turtles, indigo snakes, gopher tortoises and red wolves. It is accessible only by boat. A favorite is Wakulla Springs State Park, one of the world's deepest freshwater springs, with swimming, nature boat rides and glass bottom boats. Wakulla Springs is known as the filming location for several Tarzan movies, Creature from the Black Lagoon and Airport '77. From the river boat and glass bottom boat tours, you can see alligators, many species of wading birds, water fowl, fish, turtles, and snakes, in and among the crystal clear waters emerging from the depth of the springs. Kids love diving from the diving platform into the refreshing spring waters, which remain a constant 68-70 degrees year round. The St. Marks National Wildlife Refuge offers a habitat for all kinds of Florida wildlife. Smarter Travel recently voted the refuge as one of the top 10 wildlife refuges in America. At this swampy wildlife refuge, alligators can reach lengths of 14 feet. It's unusual not to spot them here in the marshes along the road to the 1832 St. Marks Lighthouse on Apalachee Bay. Photographers say the lighthouse is the best place to snap shots of hordes of monarch butterflies during the butterflies' annual migration in October. Whooping cranes and more than 300 other bird species stop over at St. Marks, and 98 species nest on-site. In May, watch for large groups of West Indian manatees in the waters near the lighthouse. Baby alligators emerge from nests in August. Keep your eyes peeled for bald eagles. So the guys want to go fishing and you ladies don't ... NO PROBLEM! While they are catching speckled trout, Spanish mackerel, grouper, redfish (the list goes on), you can visit historic Apalachicola. Once a bustling sea port, this quaint village of about 5,000 still boasts a large shrimp fleet, a downtown shopping area with antiques, boutiques and local art, and beautiful restored houses from a bygone era. Once the third largest cotton port along the Gulf Coast, the Apalachicola/East Point area still harvests and processes 90% of the oysters consumed in Florida. Locally caught seafood is prepared in the many fine restaurants located in Panacea, Carrabelle, and Apalachicola. If you prefer to cook it yourself, fresh shrimp, oysters, and the catch of the day are available in the seafood houses dotted along the coast from Panacea to Port St. Joe. My name is Deborah Word. My husband, Jerry, and I started visiting Shell Point in 1998. It didn't take long for us to fall in love with the Shell Point area. Since then, we purchased two canal front vacation rental homes in Paradise Village of Shell Point, with high hopes for future retirement there. We love fishing and photography, so Wakulla County is perfect for us. Several years later, I started handling vacation rental reservations for a few other property owners in the surrounding area. I currently manage five rentals in Shell Point, two in Ochlockonee Bay (Panacea) and one in Alligator Point. Shorts and Shades is a beautiful condo in Panacea. It has everything you could possibly need and is very tastefully decorated. The views are fabulous and if you like watching birds then it's even better. We are independent travellers and made our trip from Wales but everything was perfect. Communications with Deborah were very responsive and we would highly recommend. When we were approaching this location we were getting nervous I won't lie. It was quite out of the way, a long drive thru the woods. Didn't know what to expect. Then all of a sudden there was civilization and the most beautiful setting for a vacation. Waterfront balcony with such comfortable seating, we loved it. A few great resaurants nearby. The place was huge, nice large bedroom with comfy King and twin beds. Plenty of closet space and extra towels. Decorated with a beach theme but not overdone, very tastefully decorated. Kitchen/livingroom were also very large with a big comfy chair and ottoman and soft cushy sofa. If we had to complain about anything it was the bathroom. For a place this large it needs a bigger bathroom. It was so small there was barely enough room to get things done. But all in all it was a lovely condo and everything we needed was there. We used the laundry room and the pool, altho the water was very cold in late March. We still sat in the sun to catch some Florida tan to take home with us. Shorts & Shades was comfortable and convenient for a 2 night stay. The unit was well-stocked and quiet. The view from the deck were beautiful! A great place to relax and read. We enjoyed a bike ride on the nearby 16-mile Tallahassee -St. Mark Trail. We also explored Alligator Point and the state park. Time was short, but we enjoyed dinner at Angelo's and lunch at Dockside in St. Marks after the bike ride. We went into Crawfordville to buy supplies for the coming 10 days. We were fortunate to find Shorts & Shades as it was the perfect location for our trek across the Panhandle. Great views, porch sitting lovely, lots of supplies. Immediate response to a mechanical problem. 2 mile bike path or road to beach. Recommend! We loved Shorts & Shades. It was comfortable, with a lovely view of the bay. We spent a lot of time sitting out on the deck. We plan to return.